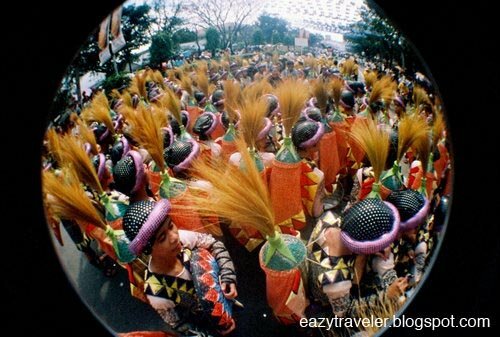 Ever since I was a kid, an occasion I look forward to every year, even more than I do Christmas or New Year, is the Sinulog Festival in Cebu City. The nine-day celebration, in honor of the Holy Child Jesus, culminates every third Sunday of January with a Grand Parade that meanders through the festooned city streets, with elaborately dressed dancers, magnificent floats and colorful ‘higantes’ (papiér-mache giants), all moving to the infectious rhythms of tribal dance and heralding “Viva Señor Santo Niño!”. The grandest of all Philippine festivals, the Sinulog commemorates the Filipinos’ pagan origins and the acceptance of Christianity in the islands. Performers from all over Cebu and other provinces join the celebration. The day before the Grand Parade, a Fluvial Procession along the Mactan Channel reenacts the arrival of explorer Ferdinand Magellan in 1521 and the presentation of the image of Santo Niño as a baptismal gift to Queen Juana, the native chieftain’s wife. Then, the image is paraded in a religious procession around the streets of downtown Cebu, accompanied by hundreds of thousands of devotees. 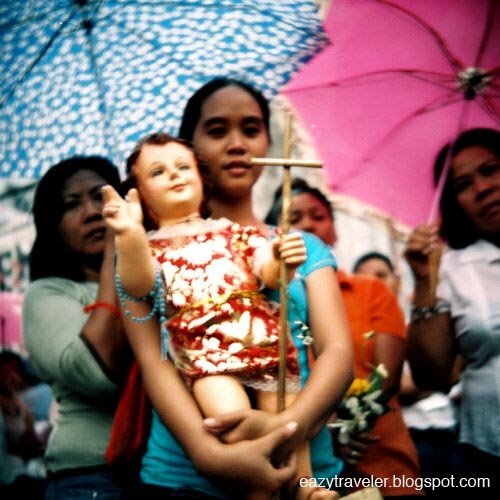 The Sinulog was inspired by the traditional ‘sinuug’, a humble prayer-dance to the Holy Child still performed by candle vendors for their customers at the Basilica Minore del Santo Niño. Before the arrival of the Spanish colonizers, this dance was performed for ‘anitos’ or wooden pagan idols, which were eventually replaced by the Santo Niño upon the acceptance of Christianity. 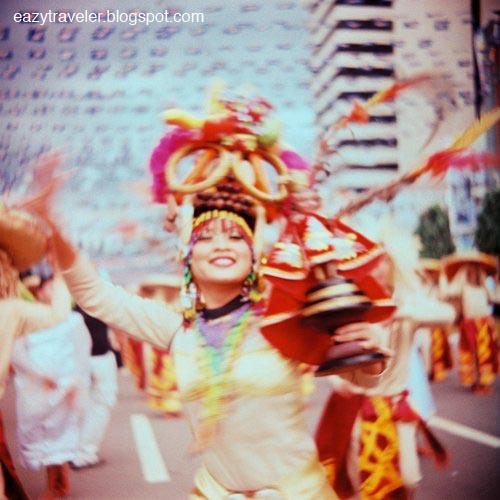 The best place to view the parade along its route is along the wide thoroughfares of Fuente Osmeña or Osmeña Boulevard. For seated viewing, one can watch the contingents onstage at the Sinulog Grandstand in Cebu City Sports Complex at the end of the route. 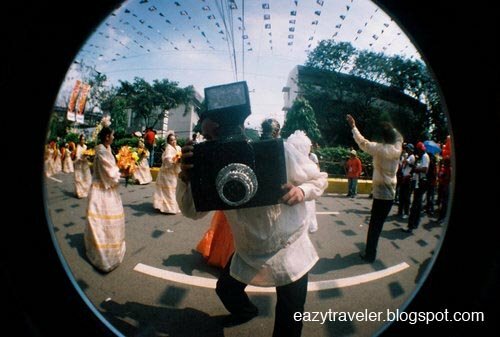 However, the best way to lomograph Sinulog is to join the parade with a photographer’s ID from the mayor’s office. At the end of the day, the festivities simmers down to drinking, merry-making and mischief in the streets. Nice set of pictures! Congrats! 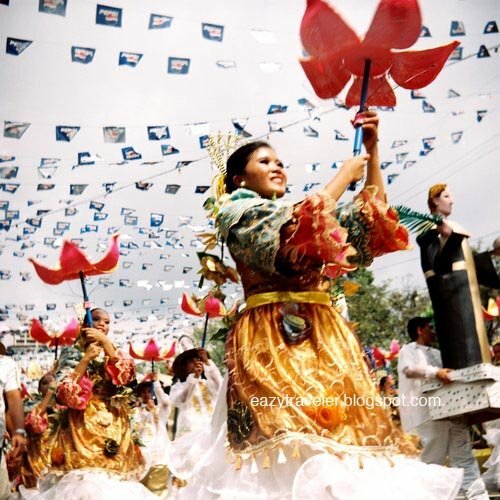 I plan to attend Sinulog 2009. Thanks for sharing. Thank you. I bet you’ll have a blast. Make sure to get hold of a photog’s pass for the parade. I might go there too… how do you get hold of a photog’s pass? Can you recommend a hotel (middle range) but with a good location? Thanks, Sidney. For accommodation, check out the cluster of pension houses in uptown Capitol area, near Fuente Osmeña, like Jasmine Pension House (032 2533757) or Verbena Pension House (032 2533430. Since January is peak season, make sure to book your rooms one to three months ahead. i miss this festival a lot. i’ve attended it for five straight years and my last was in 2002.
by this time, i only watch and download videos of sinulog from youtube.